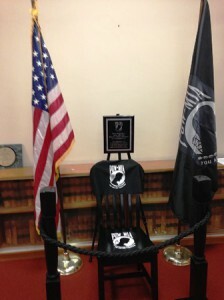 Northborough- The Board of Selectmen accepted during its Dec. 15 meeting POW/MIA Chair of Honor on behalf of the town, with plans to use it as a portable memorial to help remind residents of the approximately 100,000 servicemen and women who remain unaccounted from the nation’s modern wars. Adam Costello, the director of the Central Massachusetts Veterans District, said missions aimed at recovering the missing are ongoing. He noted that only within recent weeks were the remains of a soldier who died as a prisoner of war in the Korean conflict in 1951 returned home. “This chair is a reminder of all those soldiers and their families who never came home and to those who continue to try to find and recover them,” he said. The Chair of Honor program was begun by the Rolling Thunder motorcycle club as a way of keeping prisoners of war and those unaccounted for on battlefields from being forgotten. In recent years, the Massachusetts chapter of the club helped get the chairs installed at Gillette Stadium and other sports venues, the Statehouse and a growing number of individual communities. Some 150 chairs are now on display across the state, said Massachusetts Secretary of Veterans Affairs Coleman Nee, who was on hand for the chair’s presentation. 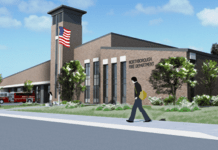 “I’m proud that as a town Northborough honors its veterans and now we also have a memorial to prisoners of war and those missing in action,” Nee said. Costello noted the contributions of Crown Trophy, which made a plaque for the chair and students at Assabet Valley Regional Technical High School, who fashioned wooden stanchions for a display around the chair. Officials said the chair may be displayed at the Senior Center and can be moved to other locations to help keep it visible.